TRE ALTAMIRA was requested by the Regional Authority of Tuscany (Italy) to provide a risk mapping service over the whole country region. The Earth Science Department (DST) from the University of Florence, representing an expertise centre for the Italian Civil Protection Department. The DST provides expertise in InSAR results interpretation. 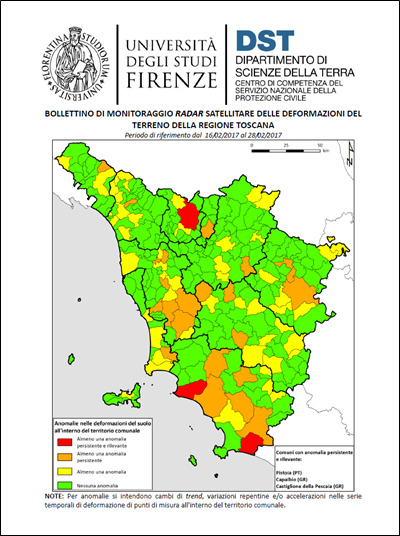 Regione Toscana, the Regional Government of Tuscany, funded the project and provides final users with InSAR results through their territory management tool. This service takes advantage of freely available Sentinel-1 imagery, specifically designed for ground deformation monitoring over large areas and operated by ESA. Millions of measurement points are surveyed over the whole region. InSAR bulletins are delivered every 12 days in order to detect areas affected by movement acceleration or sudden trend variation. More in depth analysis can be conducted in local areas where critical points are detected. Toscana. A monitoring service is active over the whole region. In the left image, fuchsia dots indicate areas of trend variation and are superimposed on the displacement velocity map by SqueeSAR®. Trend variation identifies areas where a change in the dynamic of motion is occurring. 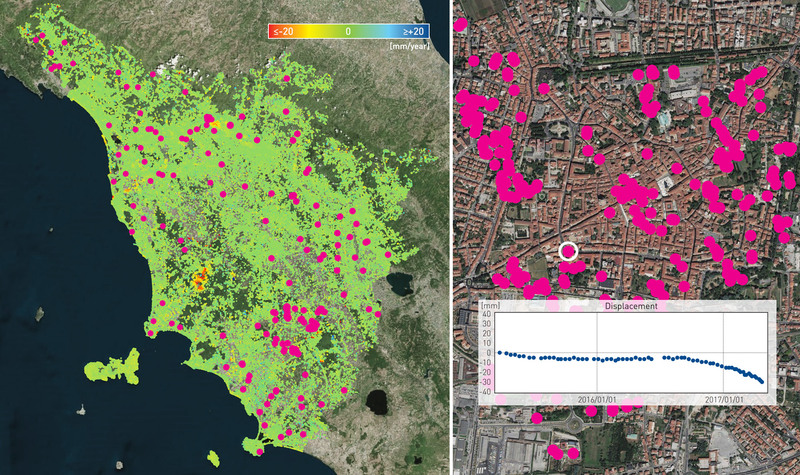 As a final stage, InSAR results are integrated into Regione Toscana’s platform for a simple and intuitive access to information by local users. You can visit our geohazards market page here.